The joyous time of the holiday season brings with it several factors that can cause stress to become out of control. But there a few simple and all natural ways that work wonders for combating that extra pressure this season! ‘Tis the season to be jolly, right? But we’ve all been there; the stress can be intense! Many times it’s as simple as forgetting a Christmas gift and realizing you only have $4 in your bank account. Maybe it’s the extra pressure of spending money and wrapping gifts, decorating your home perfectly, attending all the church events in a timely and punctual manner while making sure you didn’t forget one thing for the perfect Thanksgiving dinner. I’ve done that! One year shortly after my husband and I first got married, I realized I had no poultry seasoning for the small turkey we’d just bought. Everything was closed in the teeny rural town where we lived at the time and I had to make due with salt and pepper. To this day, every year, I buy poultry seasoning when I make my holiday dinner shopping trip. We now have 10 (possibly more) unopened jars of the stuff hanging out in our spice cabinet because I’m afraid it’ll happen to me again! But this happens to the best of us. Sometimes it is just too much and we need to de-stress. So here are a few simple and all natural ways to help you combat the stress the holidays can place on us. Another perfect way to relax is curled up with a piping hot cup of tea, next to a candle or diffuser. Teas have been known to be medicinal and have many wonderful herbs that will calm the mind and soothe away your holiday stress. My mother and I frequent a shop in Ft. Collins, Colorado and admittedly, I spend a lot of money there every time I visit her. But the aromas of the Spice and Tea Exchange are unexplainable. My mind is immediately soothed just walking in the store and being hit with the aroma of teas and spices from around the world. If you know of a similar business in your area, consider going in and asking about teas that will help with relaxation. Oftentimes, chamomile teas offer a calming effect on the mind and coupled with a scented candle, it’ll be hard for the holiday stress to not melt away. Peppermint teas and lemon teas also offer soothing and stress relieving flavors and aromas. Or, you could go for the Sleepy Time tea by Celestial Seasonings that even our small rural grocery store stocks. In addition to herbal teas, taking a stress-reducing supplement like Xivvium For Stress a few weeks prior to the stressful event can help keep high-tension get-togethers running smoothly. What I like about this supplement is it is a broad-spectrum that combines herbs, vitamins, and nutrients such as 5-HTP, St. John’s Wort, and Valerian Root to promote stress relief – all the right stuff to help you when you need it the most! As we breathe in the scents of the oils, our brain is prompted to think positive thoughts, and the scents can stimulate a calming effect. 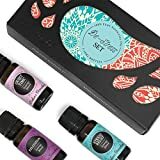 Using essential oils while deeply breathing in through the nose (and smelling the wonderful aroma of the oils) and exhaling fully through the mouth can be one of the most effective ways to destress all naturally, immediately, on your own in the privacy of your own home. In addition to lavender, try diffusing chamomile, ylang-ylang, rose, vetiver, and bergamot to relieve stress. The simple act of calming the mind’s constant chatter can help the human body unwind. Depending on your personal spiritual belief system, you may prefer the term prayer, however, both will have a similar destressing effect on the brain. Prayer and meditation can help you avoid getting too frustrated with the “little things” in daily life and help you look at the “bigger picture.” Spirituality (or religion, if you prefer) can also offer much-needed comfort and strength when dealing with stressful situations. Relaxing the mind can help us realize what’s important and which things we should let go. Deep breathing while praying or meditating will also help provide oxygen to the brain and keep our body calm as we release the tensions of the day from our body. Breathing deeply will help your body’s functions and breathing slow down. Your heart rate and blood pressure will lower, your muscles will relax and release the tension, and even your brain will become less active. This is a personal favorite of mine. I like diffusing essential oils, and I enjoy my nightly meditation. But there is just nothing like lighting a candle and having the lovely warm glow light up your day. And science has agreed that candles do have a calming effect on the mind. The gentle, mesmerizing quality of their light makes them a perfect aid for any relaxation routine. The low light that comes from a candle is captured by your sight and sent straight to your brain for processing. Because of our associations with candlelight, the body begins to relax both emotionally and physically. You can also take the science of relaxing with candles one step further though; by lighting scented candles proven to transform your mood. Like essential oils, adding in a calming scent to the soothing glow of candlelight will not only have the waxes melting, but stress melting away as well. This doesn’t mean that you have to go on a spending spree and be generous with your bowstring tight budget. But, one of the best ways to stay calm, content, and cheerful this time of year is to act generously with your loved ones, co-workers, and friends and the way you compliment them or help them. Tell your co-worker you love her dress, or make sure to compliment the food your neighbor made for you out of genuine affection. You can also generously offer to do loved ones dreaded errand. If a friend is stressed, offer to give her your soothing candle to try or invite her over for a chat and a cup of your favorite relaxing tea. Helping others will always help you and it will be mentally beneficial for everyone involved. And isn’t that really what the holiday season is about anyway?